Venice, the capital of the Veneto region, is located in the northeastern portion of Italy. It may be one of the most beautiful, romantic cities in Europe! People speak of this UNESCO World Heritage Site as a city, which it is. But many don’t realize it is actually situated across 118 small islands in the shallow Venetian Lagoon, separated by canals and linked by 400 bridges. Getting around the city is either done by foot or boat. Walking is quite comfortable since there are no vehicles and the distances to cover are not significant. 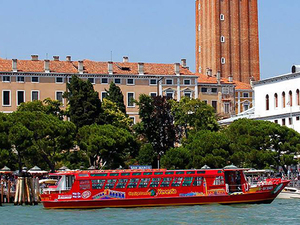 We offer the absolute best options for your tours and cruise shore excursions in Venice, Italy! The multi-lingual audio narration on the boat - available in 6 languages! Stops at the must-see sites with 6 set stops to hop on and off where you want! Option to stay onboard for the full circuit! Get around and see it all on this flexible Hop On Hop Off Boat excursion! Virtually unchanged for the last six centuries, Venice is one of the world's most-visited vacation destinations, with endless places to explore and sights to see. Venice has retained its romantic charm, featuring a picturesque setting on the intricate canal system, exquisite architecture, and priceless works of art to see. 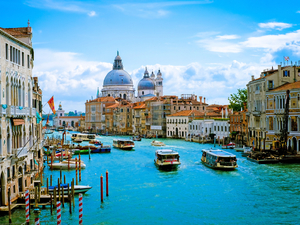 Roundtrip private transportation from your Venice cruise terminal! Private boat for your group up to 8 maximum! English speaking professional captain and private guide! Cruise the Grand Canal in Venice! Skip the line tickets to St. Mark's Basilica! Guided walk of St. Mark's Square, St. Mark's Basilica, Doge's Palace and Bridge of Sighs! Cruise to the island of Burano and visit the lace-making factory! Optional visit the island of Murano and visit a glass-making workshop (time allowing)! This Private Full Day excursion will take you to explore the best of Venice by boat. You'll see St. Mark's Square. St. Mark's Basilica, the Doge's Palace and more! Then, your boat would take to Burano, a charming colorful town. If times allow, you can also visit Murano and a glass-making workshop. Private round-trip transportation from your Venice cruise terminal! Private boat ride through the Grand Canal! Private English speaking, professional excursion guide! Walk St. Mark's Square, St. Mark's Basilica, the Doge's Palace and the Bridge of Sighs! 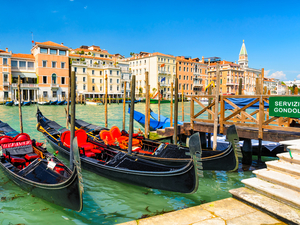 Visit the Rialto Bridge, Fenice Theatre, the gothic church of the Frari and many more! With this Private Walking Excursion, you will visit the most iconic places of Venice. You'll see St. Mark's Square, St. Mark's Basilica, Doge's Palace and many more! Enjoy a gondola ride through the Grand Canal and you'll have free time for lunch. 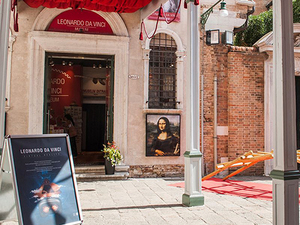 Skip the line entrance ticket to the Leonardo Da Vinci Museum! Open from 10:30 AM to 05.30 PM! Whether you are an admirer of Leonardo da Vinci and his work, or just want to learn more about this amazing man, you can avoid the long lines and begin your interactive experience through this Skip the Line Excursion. This family-friendly museum showcases his art and scientific prowess through multimedia, multi-language audio guides, and professional exhibits.